The connection between birds and fleshy fruits is a beautiful example of coevolution. Birds receive a nutritional “reward” for eating the fruit and the plant benefits by way of seed dispersal. The coevolutionary piece continues, as the seeds within most fleshy fruits have a particularly hard seed coat that protects them through the bird’s gut that often require this “pre-treatment” for germination, which are then deposited in a plop of fertilizer. Note that many dry fruits and seeds are digested by birds and are not typically bird-dispersed except by adhesion to feet and/or feathers. Dry seeds and fruits, like those in the sunflower/composite family (Asteraceae) and bean/pea family (Fabaceae), are produced in ample quantities that can sustain both “sharing” with birds (and other critters) and with plenty left for dispersal by wind, water, etc. 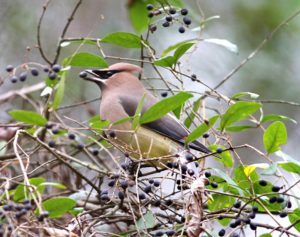 Cedar waxwing eating fruits of invasive Chinese privet. Birds are generalist feeders when it comes to fleshy fruit selection and will eat what fits in their beak, which is another example of coevolution through natural selection. And because birds are as likely, or even more likely in some cases, to disperse an invasive plant as a native plant, the bird/plant mutualism has been spoiled. 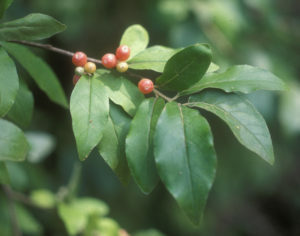 Of the approximately 6,000 native plant species in the Southeastern US, about 1/3 have fleshy fruits and are bird-dispersed, whereas nearly ½ of the approximately 450 invasive plant species in this same region are bird-dispersed. Birds are therefore a primary vector for moving actual and potentially invasive plants from the cultivated landscape to natural areas. And once established in natural areas, the spread continues in leaps and bounds. This is why bird-dispersal is a primary risk assessment character for evaluating plant invasiveness potential. 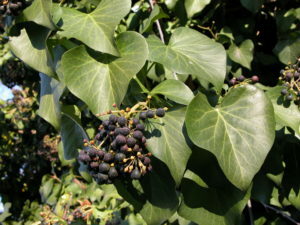 Most of the most serious invasive plants in our area have fleshy fruits and are bird-dispersed, such as English ivy, Autumn olive, Chinese privet, Oriental bittersweet, Porcelainberry, Multiflora rose, and Japanese honeysuckle. The scientific literature on invasive plants and bird-dispersal is moderate but growing, and almost all of the research warns that this is a serious and multi-layered phenomenon. First off – birds either do not discriminate between native and invasive plants or often prefer invasives over natives. One reason for this is that a large proportion of invasives are high in carbohydrates, whereas the natives are often higher in protein and lipids/fats. Birds are consequently (pardon the analogy) choosing candy bars over cheeseburgers, which could affect bird nutrition, particularly during fall migration. My own research on this subject confirms that invasive plant fruits are often preferred over natives. I showed that there is, for example, a strong preference for the invasive camphor tree (Cinnamomum camphora) and autumn olive (Elaeagnus umbellata), over the native Red bay (Persea palustris) and Downy arrow-wood (Viburnum rafinesqueanum), respectively. This competition for reproduction via fleshy fruit dispersal is a particularly insidious and negative invasive plant effect that is widely unknown and certainly understudied. 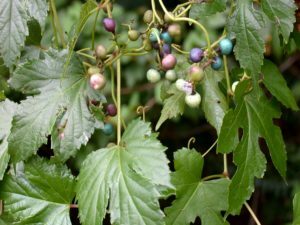 Researchers have also shown that many invasive plants have fruits that persist longer than do native plant fruits into the fall and winter. The invasives are therefore available when our natives are not. Nandina with poisonous fruits taking over understory. One particularly worrisome study showed that male cardinals that ingest the red fruits of the very invasive and widespread Amur honeysuckle become strikingly colored. Bright color typically signals superior health, and females tend to choose these individuals as mates. But less fit, or even sickly, males are now pumped up on these red pigments who could compromise the benefits of selective mate choice. 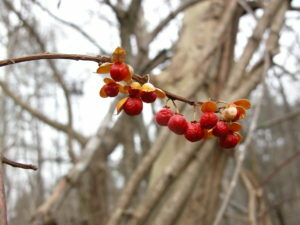 To summarize, the cascade of negative effects wrought by bird-dispersed invasive plants include: 1) invasive plants with fleshy fruits are spread far and wide by birds, which is enhanced in the winter; 2) bird nutrition is compromised when a carbohydrate rich invasive is chosen over a protein and/or lipid rich native; 3) native plants can be out-competed for reproduction by invasives, which disrupts their overall fecundity; and 4) overall bird population health could decline because females cannot distinguish between sickly and vigorous males with whom they might mate. Do not fret over this gloomy scenario! You can make a difference! Work to remove the invasive plants from your landscape, plant natives, encourage others to follow your lead, request the nursery industry and garden centers to remove the invasive plants from their inventory and offer more natives, and visit the North Carolina Botanical Garden for ideas on how native plants can be used in the landscape. Note too that the foliage of non-native plants is generally indigestible by the caterpillars of our moths and butterflies, which means that birds don’t have the primary “baby food” for their young (a la Doug Tallamy). Invasive vines growing up trees should be cut before they set fruit. If the invasive plants in your landscape are already in fruit, and you don’t have time to remove and replace the entire plant, cut off or strip the fruits from the branches. Do not put these fruits in the yard waste for street pickup, since this plant material is often made available later as mulch or compost, and you will therefore facilitate invasive plant dispersal. Put the seeds in a bag for the landfill unless the yard waste is hot-composted before it’s made available to the public. English ivy fruiting after it climbs tree. 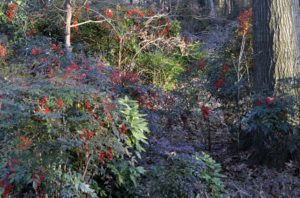 Here are invasive plants in North Carolina that are spread by birds and should not be planted. If they are in your garden already, they should be removed or controlled as soon as feasible. (from the NC Native Plant Society’s invasive plant lists for North Carolina). Rank 1 – Severe Threat 12 of 27 have fleshy fruits spread by birds as follows! Rank 2 – Significant Threat 23 of 51 have fleshy fruits spread by birds as follows! All photos by author unless noted.